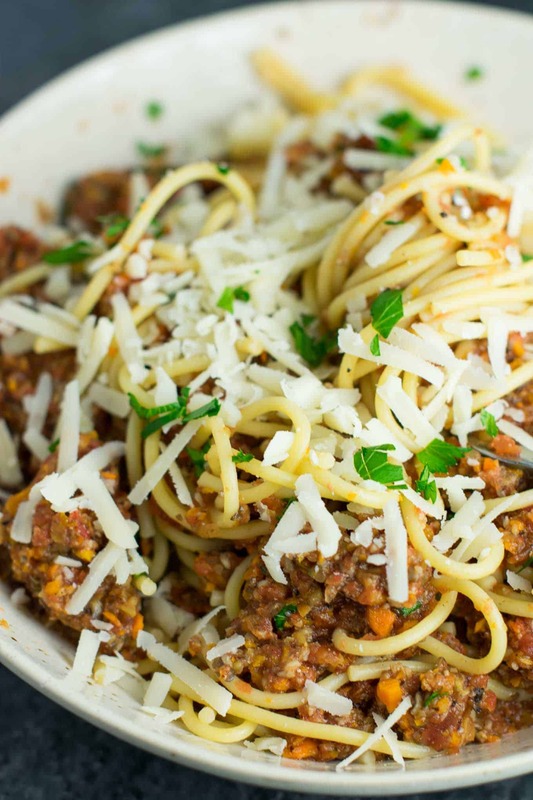 Bolognese sauce is a classic family favorite dish. Today I’m sharing a delicious alternative to the traditional bolognese sauce – vegetarian bolognese! As a vegetarian (and just a carb lover in general), pasta is one of my favorite meals. It’s a great way to get lots of veggies, pasta, and protein for a well rounded meal. 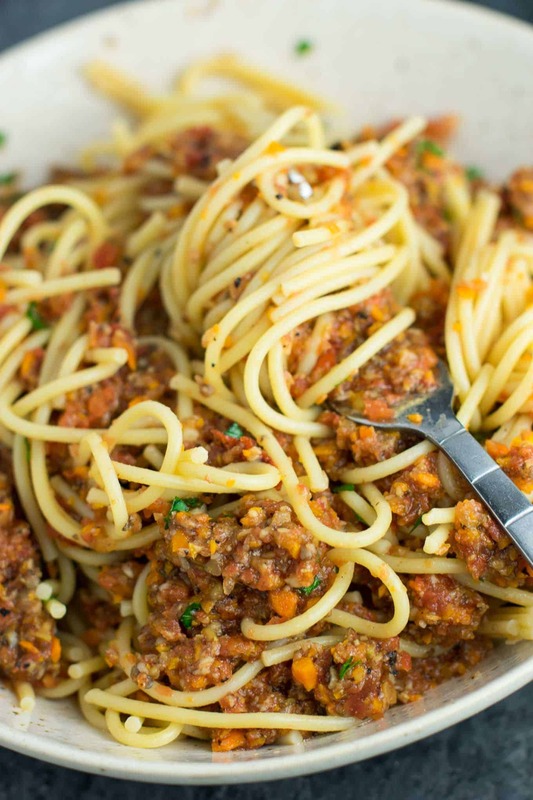 Take me to the vegetarian bolognese sauce recipe! 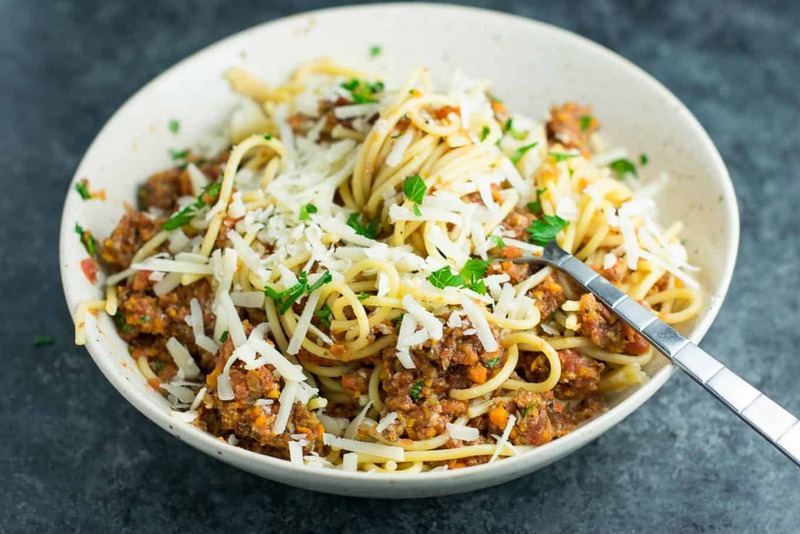 If you would like to skip my (helpful) tips and tricks, similar meatless recipes, and suggestions for the best bolognese sauce, simply keep scrolling to the bottom of the post, where you will find a printable recipe card with instructions and ingredients. Keep reading this post for my helpful tips! It’s super satisfying, packed full of good for you ingredients, and tastes amazing! First up, we will be using a food processor to make the veggie prep super easy. If yours is small like mine, you can process in batches. Otherwise just throw all the veggies in at once! I started by processing 8 oz of baby bella mushrooms with 5 oz of golden oak shitake mushrooms. 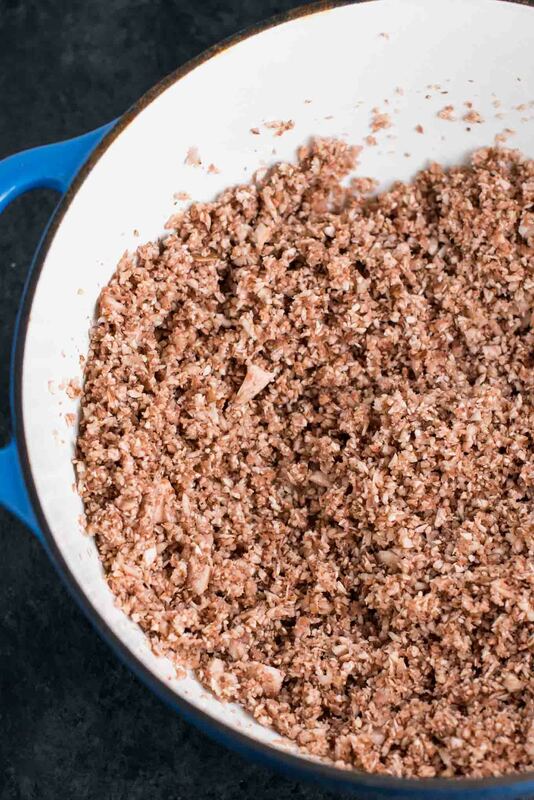 Process them up until they are in minced like texture. Next come celery, carrots, garlic, and onion. Mince it all up until it is in tiny pieces like the mushrooms. 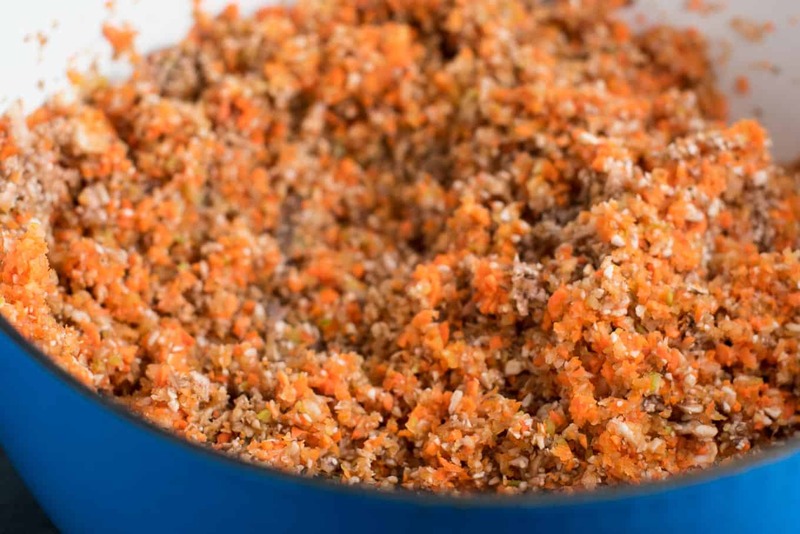 Once it’s all nice and minced up it will look like this picture below. Time to let the veggies sweat and cook the liquid out. Cook the veggies for around 25-30 minutes (I used my dutch oven to cook mine), until most of the liquid has evaporated and the veggies have reduced in volume. Next, puree fire roasted tomatoes in the food processor, add some spices, and a touch of sugar and it all comes together! The fire roasted tomatoes add a great depth of flavor, and the spices help round it all out. 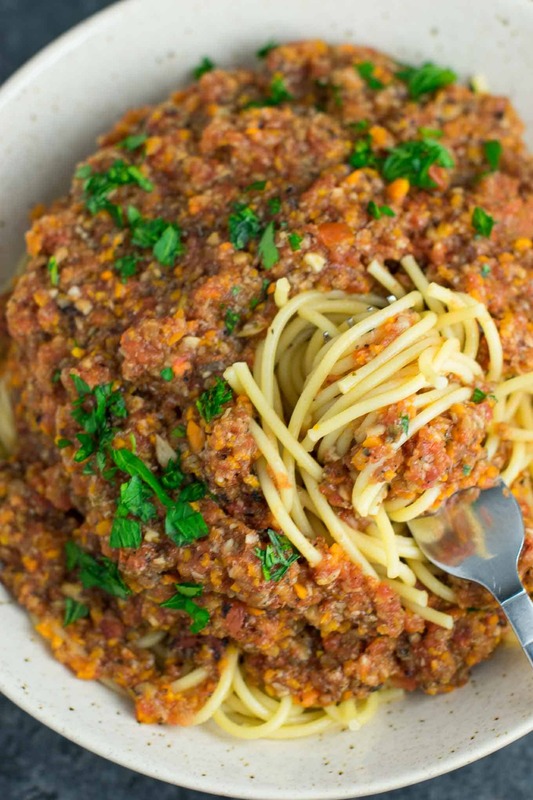 The texture of the vegetable bolognese is so meaty. I was genuinely surprised that it felt to me that I was eating meat sauce! All of the veggies also made this super filling and I ate way less pasta than I normally would. Don’t just take my word for it! 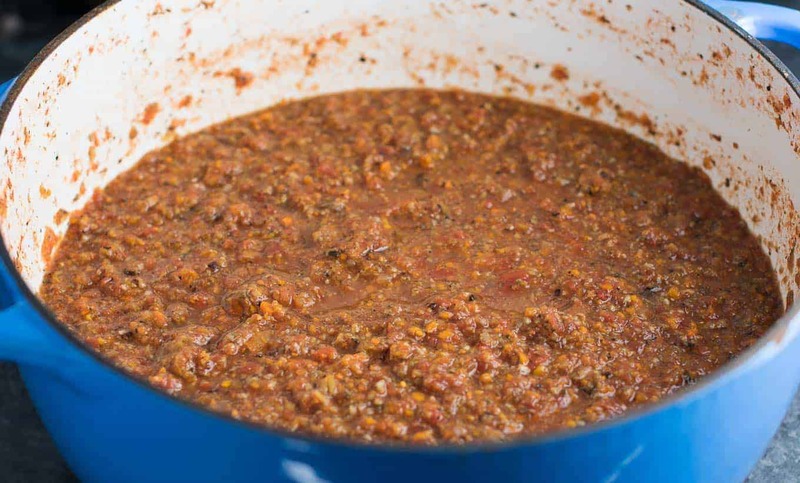 Here are a few reader reviews of this bolognese sauce. Scroll down to the bottom of the post to read more comments! Richard: “Made this last night and ooohhh what a wonderful Bolognese. I’ll probably never make it with meat again. Top with fresh chopped parsley if you want for more added flavor. I like to do this for that little extra garnish and flavor. If you’re vegetarian and not vegan (like me), parmesan cheese is a great topping for this recipe. Freshly grated is best! You could also top with vegan parmesan or nutritional yeast to keep it dairy free. While I usually don’t try to make meat substitutes in my recipes, this was definitely a great substitute for someone that might be transitioning to vegetarianism (or just as a meatless meal in general). It’s honestly so delicious and so filling. You won’t miss the meat at all! This recipe makes a huge batch of sauce so it is great to feed a lot of people! Be sure to tag me on instagram @buildyourbite and hashtag #buildyourbite with your recipe creations. Want to save this recipe to Pinterest for later? Click HERE to pin this recipe! 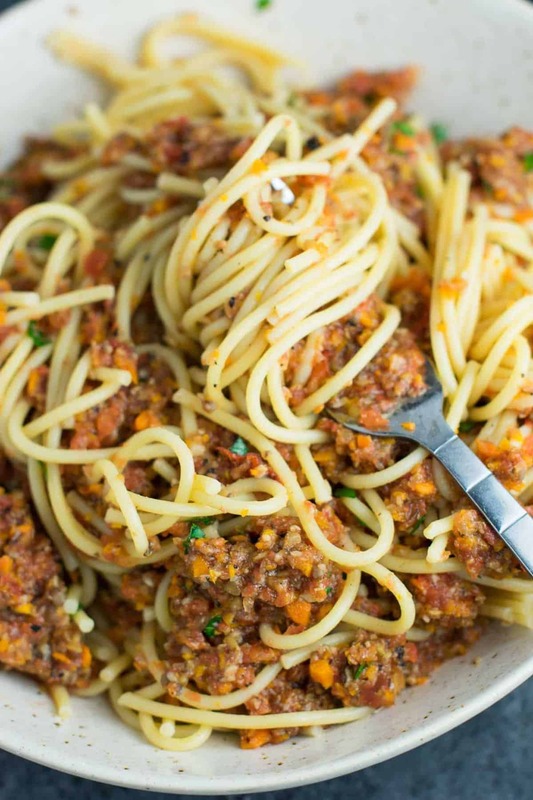 Vegetable bolognese recipe made with mushrooms, carrots, celery, garlic, and onion. 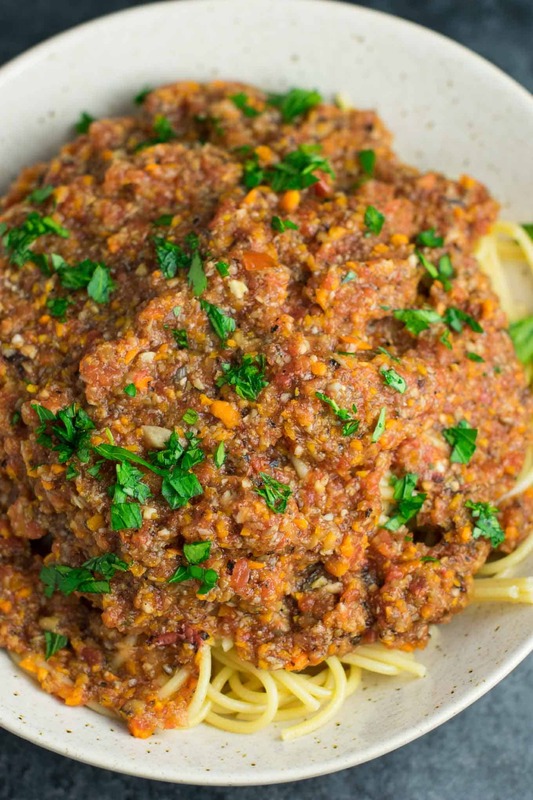 A delicious meatless vegetarian "meat" sauce recipe. I have made this today and LOVED it, thank you so much, it’s such a great idea! I make normal bolognesr all the time and even my kids didn’t notice anything different about it . So glad your family enjoyed the recipe Noelia! And the kids too – that’s awesome!! I just made this for my kids . They loved it and so did I. So much flavor! Super easy to make, also. We don’t eat meat and this was a fresh new recipe. Could this be frozen? It’s two of us at home now but it sounds so good I’d like to freeze letovers for a future meal. I have not tried freezing it, but I think it would work just fine! Made this last night and ooohhh what a wonderful Bolognese. I’ll probably never make it with meat again. So flavorful and actually a light meal when you cut back on the pasta. I’m going to try lasagne rolls stuffed with this amazing sauce. IT’S A KEEPER FOR SURE! I’m so glad you and your family enjoyed the recipe TJ!